– Is peace possible between Jews and Palestinians without transforming Israel from a Jewish colonial state into a secular democracy? Published in The Palestine Chronicle the 16th of September 2003. Zionism is the political ideology behind the vision of a Jewish state (Eretz Israel) extending to the Jordan River and beyond. The ideology’s slogan ”A land without a people for a people without a land” ignored the fact that Palestine was already inhabited. In order to create a Jewish state, it was necessary to displace a sufficient number of those people. Thus, what we today call ethnic cleansing (”transfer” in Zionist terms) is integral to the ideology. Israel was formed in 1948 once a substantial Jewish majority had been ensured by means of immigration, terror and expulsion of the native population. Israel’s lack of a constitution or fixed borders is fully consistent with Zionism’s call for continual expansion. The apartheid system and racism inherent to Israel’s laws and ordinances is a natural result of that setup. A common myth is that Israel is an ordinary secular democracy. Here are a few facts about Israeli ”democracy”. All Jews living outside of Israel are entitled to immigrate and become citizens immediately, while some 800,000 Palestinians whose families (now about 4 million) who were expelled from their homes in 1948 are prohibited from returning. No party that opposes the principle of a ”Jewish state” is allowed to participate in parliamentary elections. Non-Jewish Israelis, who constitute 23% of the entire citizenry, cannot purchase government-owned land. Many Arab villages in Israel are not zoned as residential areas, as a result of which they have no access to public services, such as electricity and water. Jews in Israel may not marry non-Jews. Israeli ID cards indicate whether the holder is Jewish or not. The disqualification of most Arab Israelis from military service reinforces discrimination when it comes to social benefits, education and the like. In addition to being an accomplished military strategist, Ariel Sharon is a highly successful Zionist. The ongoing colonization and covert ethnic cleansing of the West Bank are fulfilling the Zionist vision of establishing a Jewish majority in all of Eretz Israel. The results of Israel’s parliamentary elections support the state terrorism and violations of international law that underlie such policies. The Palestinians, on the other hand, have not voted in favor of individual terrorism (suicide bombings), while Yasser Arafat remains under house arrest by the Israeli government. Israel’s potent arsenal contains weapons of mass destruction, including nuclear arms. Palestinian society in both the West Bank and Gaza is the target of systematic devastation and military control. Israeli agents carry out non-judicial killings (assassinations) of Palestinians who are regarded as a threat to Israel. Israeli soldiers murder international peace activists. The Israelis are uprooting olive trees, building a ”security fence” that separates Palestinian villages from cultivated land, blowing up homes and shooting at ambulances. Undernourishment among Palestinian children is on the rise. Palestinians are still being forced to abandon their homes. Daily curfews, along with over 100 military checkpoints, have turned Palestinians into prisoners in their own towns and villages. By establishing ”facts on the ground,” the Zionist project is making a Palestinian state less and less feasible. Israel has constructed some 200 Jewish settlements on the West Bank, all of them illegal under international law, and expropriated more than half of the land. Ninety percent of Palestinian-owned territory inside the borders assigned to Israel by the 1948 partition has already been confiscated. Racism, apartheid and ethnic cleansing are the tools by which Zionism has created a colonial state. Since all of Israel’s prime ministers have been Zionists, it has made little difference which one of them has been in power at any particular time. Both the Oslo Agreements and Ehud Barak’s ”generous offer” resembled nothing so much as a Bantustan solution, ignoring the rights of Palestinian refugees and guaranteeing Israeli sovereignty. Such approaches do more to solidify and expand the current apartheid state than to promote a viable Palestinian state. Israel’s objections to the road map of the Quartet (the UN, the EU, Russia and the U.S.) represent more of the same old politics and stand in direct contradiction to Sharon’s avowed desire for peace. Israel is continuing to carve up the West Bank into isolated Palestinian areas surrounded by Jewish roads and settlements and connected by tunnels under Israeli control. Palestinians enjoy only limited human and civil rights. The Israelis categorically reject the rights of Palestinian refugees as protected by UN resolutions and international law, while insisting ­ also in opposition to the international consensus ­ that Jerusalem will remain the capital of Israel only. What the Palestinians are being offered in 8% of Israel/Palestine is a hodgepodge of the old South African apartheid system and the Jewish ghettos of 19th century Europe. The time has come to examine what the real agenda of the United States is when it comes to the road map. How can peace ever be achieved in such a small area between an apartheid state and a fledgling state when one of them discriminates against the large percentage of its own citizens that have the same ethnic background as the population of the other state? Not to mention the fact that the first state is a military and economic Goliath, while the other one is a David. It is becoming increasingly obvious that Israel must become a secular democracy in order for a just and lasting peace to emerge. Such a state must serve all its citizens, offer equal rights to every ethnic and religious group and abstain from favoring Jews over everybody else. An Israeli state instead of a Jewish state ­ that is the kind of states in which we Jews outside of Israel want to live. Serious discussion is also called for about alternatives to a two-state solution, including a fully secular state for all of Israel/Palestine, a bi-national (possibly federal) state or a regional federation. Any of those approaches would guarantee both peoples access to the entire region, while joint treaties could ensure the protection of specific national interests. Both Jews and Palestinians are already intertwined, both economically and geographically. A multicultural secular democracy could be the most promising solution to all aspects of the conflict. To advocate a two-state solution without questioning Israel’s apartheid system is to indirectly accept a permanent colonial arrangement. As a result of the focus on such a solution, criticism of Israel’s policies has been muffled, while expansion and ethnic cleansing have been allowed to proceed unchecked. A just peace in Israel/Palestine requires the establishment of one or two secular democracies ­ in other words the transformation of the Jewish colonial state. Israel is in the process of fulfilling the Zionist project, leaving only two options: democracy or genocide. The first step toward democracy and peace is an immediate end to the occupation of the West Bank and Gaza. Source: The Palestine Chronicle. 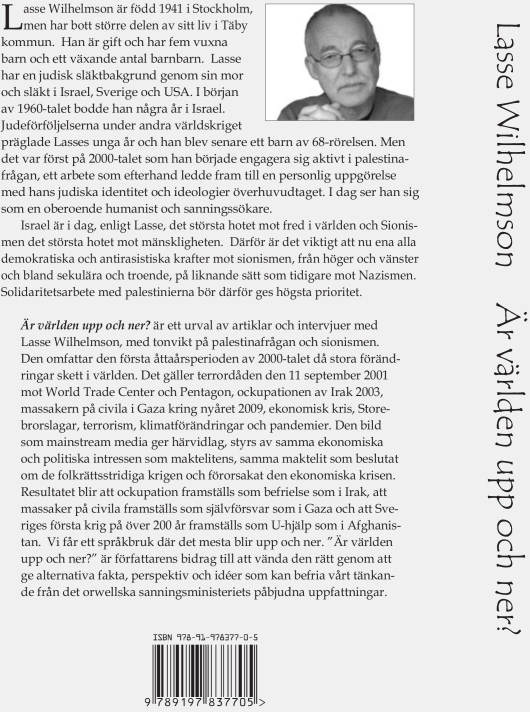 A modified version of this article was published the 3rd of June 2003 in one of the two bigest dayly morning newspapers in Sweden ­ Svenska Dagbladet (independent conservative). 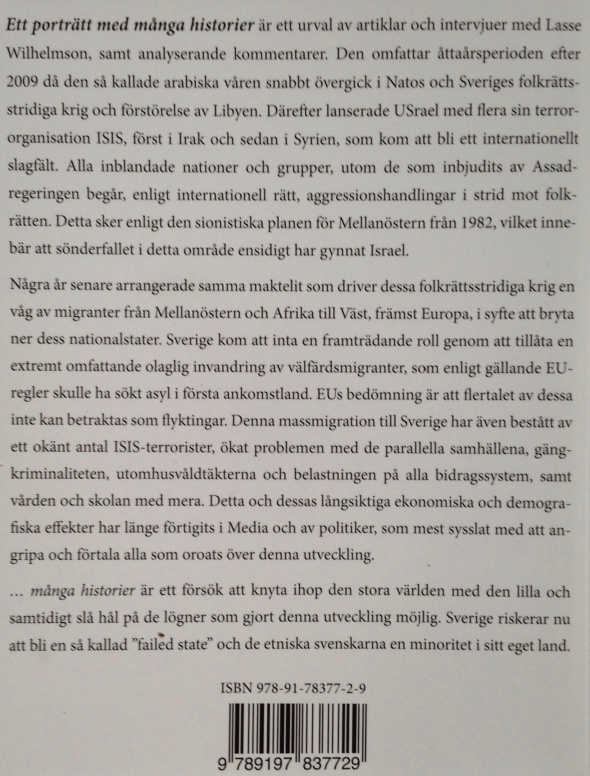 Read in Swedish: Demokrati eller folkmord?